There are fifteen Counties in Arizona. There is one defunct county: Pah-Ute County formed in 1865 from Mohave County and returned in 1871. Four Counties (Mohave, Pima, Yavapai and Yuma) were created in 1864 following the organization of the Arizona Territory in 1862. The newest, La Paz County was created in 1983. Greenlee County is a county located in the southeastern part of the state of Arizona. Based on the 2010 census, its population was 8,437, making it the least populous county in Arizona. Clifton. Greenlee County was created on March 10, 1909 from part of Graham County. The county seat is Clifton. The county was named for Mason Greenlee, a pioneer prospector in the area. 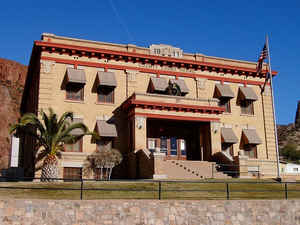 The economy of Greenlee County is dominated by the Morenci Mine, the largest copper mining operation in North America, and one of the largest copper mines in the world. As of 2008, the mine complex, owned by Freeport-McMoRan, had about 4,000 employees. The County was named after Mason Greenlee, an early day mining man. Greenlee county was formed from the eastern part of Graham County by an act of the 25th territorial meeting on March 10, 1909. It was the 14th county. There was great struggle to the formation of this new county because Graham County would loose substantial revenue. As a negotiation Greenlee County assumed $146,000 balance due that Graham County had and Greenlee County was smaller than originally proposed. The County was named after Mason Greenlee, an early day mining man. The County is 120 miles long and 20 miles wide it covers 1,837 square miles. The greater part of the land is government owned. The Forest Service controls 63.5 percent; the Bureau of Land Management controls 13.6 percent; the State of Arizona controls 14.8; and individual or corporate ownership is 8.1 percent. Greenlee County has a population of 8,605 (2002 Census). Clifton's population is 2,595; Duncan's population is 825; Morenci's population is 1,882. Clifton is the county seat. The copper commerce has been an important industry in Greenlee County and the State of Arizona for more than 130 years. The Morenci mining district has evolved into a world class operation providing approximately 18% of the world copper production. In recent years, more people are discovering the many rich and varied scenic and recreational delights to be found here. 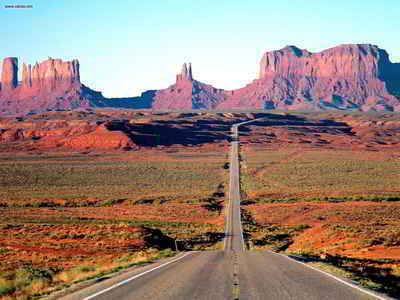 Greenlee County is becoming increasingly important as a travel attraction in the State of Arizona. As reported by the Census Bureau, the county has a total area of 1,848 square miles (4,790 km2), of which 1,843 square miles (4,770 km2) is land and 5.3 square miles (14 km2) (0.3%) is water. 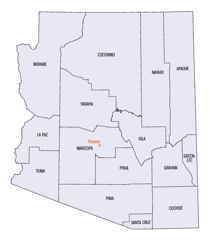 It is the second-smallest county by area in Arizona. Arizona's second-smallest county is known for Hannagan Meadow and the Blue Range Primitive Area, the last such area in the US The Coronado Trail (US Route 191) traverses most of the county from north to south. The topography consists of desert terrains, river valley, and high mountain ranges. In about a four-hour drive you can experience dramatic environmental changes ranging from the cacti of the upper Sonoran desert to spectacular and sweeping slopes of mountains covered with pine, fir, and aspen. The life zones that exist in the 127 mile trip from Clifton to Springerville are the same as what you would see on a road trip from Mexico to Canada. Mining and stock rising are the principal industries. Southeast: Grant County, N.M.; Hidalgo County, N.M.